Summer is here and it’s barbecue season! You should make a point of doing this every time you change a propane tank as well. Spray soapy water on the connections, and supply lines. If you see bubbles, turn off the tank, and try re-connecting. If it still bubbles, then gas is still leaking. Shut off the tank and get the leaky part replaced. Remove the grates and lava rocks, and check out the burner. If it looks good visually, then fire it up and make sure that you have an even flame throughout. If not, then replace it. Most burners only last 1 or 2 seasons, depending on how much you use your barbecue. Since you already have the lava rocks out, why not clean out all the ash and grease that’s accumulated at the bottom of the barbecue. While you’re cleaning, check the unit for rust, and any signs of deterioration. Don’t forget to check and clean out the venturi tubes that deliver the gas to the burner. If they get plugged up, the gas will get diverted elsewhere and could pose a hazard. Make sure that the barbecue is at least 5 feet, or better yet 10 feet from the house, or any other material that could catch fire. Only open your propane tank a quarter to one-half turn. That’s all the gas your barbecue needs to operate, and if you have a problem, then it’s much easier to shut off. Unless you’re keen on joining the space program, always open the barbecue lid before you light it. If it doesn’t fire up the first time you try it, then shut it down, and try it again in about 5 minutes. From the time you light the barbecue, till you’re finished cooking, stay with your fire. Most accidents happen when you leave a barbecue unattended. 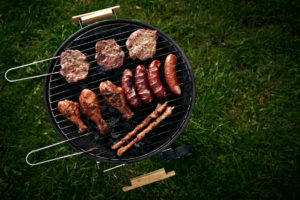 Always make sure that the barbecue is in a safe place, where kids and pets won’t touch or bump into it. Keep in mind that the barbecue will still be hot after you finish cooking, and anyone contacting the grill could be burned. Never bring a barbecue grill inside your home or garage. This is both a fire and carbon monoxide poisoning hazard. If you use a barbecue lighter, make sure you don’t leave it lying around where the kids can access it. It won’t take long for them to figure out how to use it. 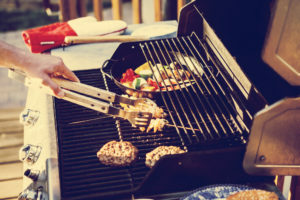 When you’re finished barbecuing, always make sure that you not only shut off the barbecue, but shut off the propane tank as well. Always store propane tanks outside, in a well-ventilated area. Never use gasoline to get the coals going. Instead, use charcoal lighting fluid. Let the lighter fluid soak into the coals for a minute or so before lighting it. That gives the explosive vapors a chance to dissipate. Stand back from the coals when you ignite them, and make sure you didn’t accidentally spill any fluid on yourself, or on any area surrounding the grill. Before you light the coals, make sure that you put the lighter fluid a safe distance away from the fire. If the coals start to die out on you, don’t spray lighter fluid on the hot coals. You could end up with explosive results. Always extinguish the coals when you’re finished barbecuing. Here’s a safe way to do it. Wearing oven mitts, take the coals out of the barbecue with tongs, and submerge them in a metal pail of water. Always make sure that you keep your fire safe from children. Make sure the grill has an ‘ash catcher’ or that ashes cannot fall down through holes in the bottom of the grill. Be safe, never place the grill on a wooden deck or porch. Always keep a cover on the grill when unattended and be particularly careful when grilling in strong winds.